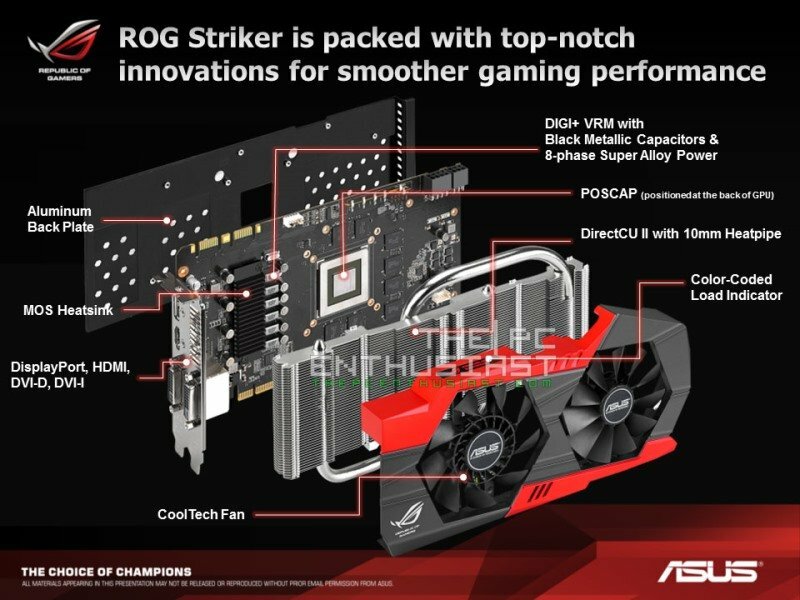 Asus has officially announced the Asus ROG Striker GTX 760 Platinum 4GB graphics card, featuring a huge 4GB GDDR5 memory, a new DirectCU II cooler design, more overclocking capability and an old GK104 Kepler chip. When you look at the graphics card itself, you would not expect that it’s a mid-range card, since it looks like a top tier graphics card, plus there’s a unique red LED on the PCB near the power connectors, aside from the “Republic of Gamers” logo which has color-coded load indicator on its side. Check out the rest of its features, specifications and my initial test review below. 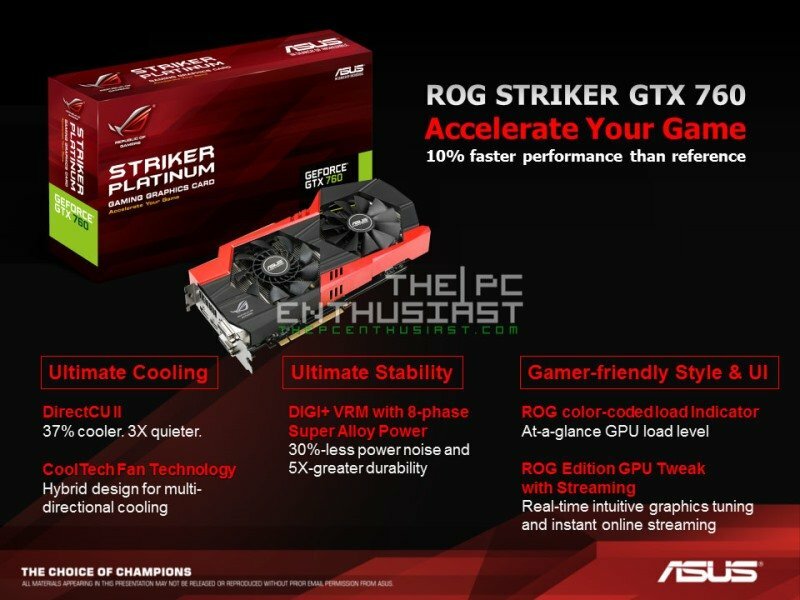 Meanwhile, Asus is also planning to release a non-platinum variant of the ROG Striker GTX 760. But the only difference is that its base clock is 980MHz with a boost clock of 1033MHz. I’m not sure if the non-platinum variant or the standard version of the STRIKER-GTX760-4GD5 will also look the same with the platinum version. 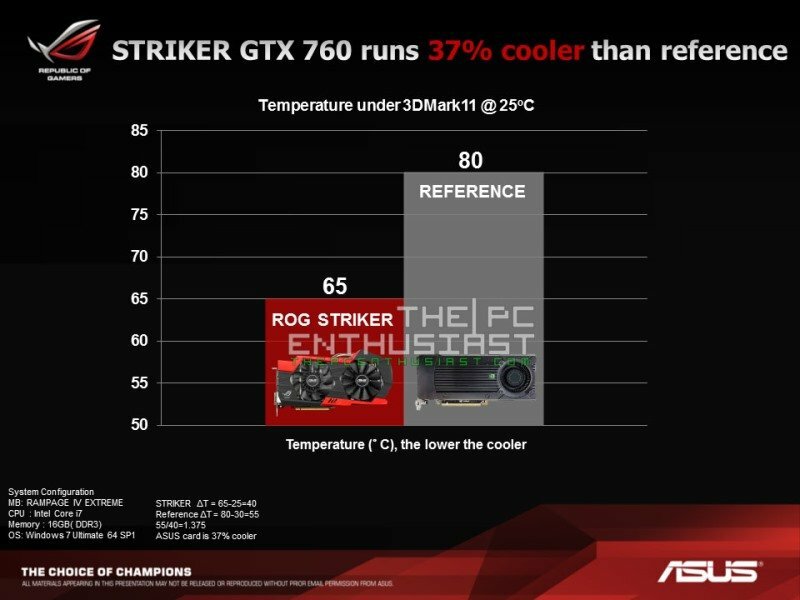 The Asus ROG Striker GTX 760 Platinum sports a new DirectCU II shroud design, somewhat similar to the Asus ROG Matrix’s design. 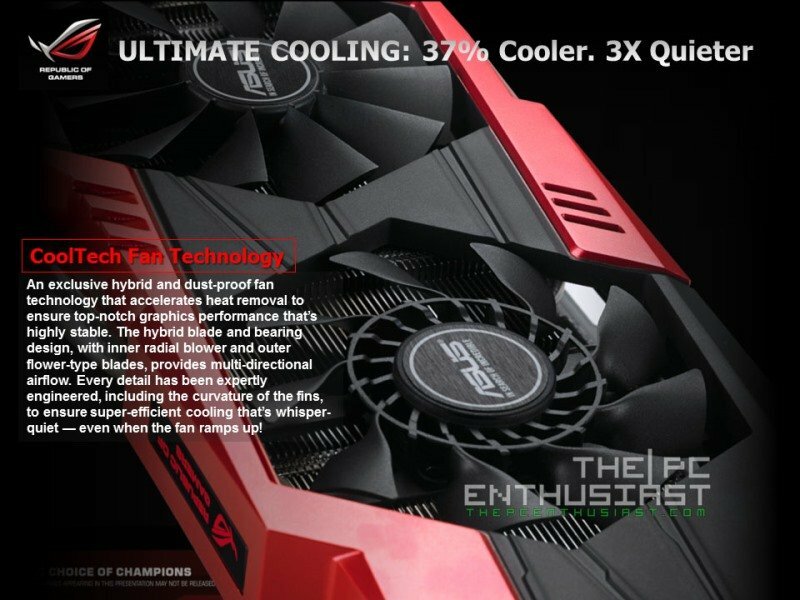 It features CoolTech Fan technology and a DiGi+ VRM with 8-phase power design, Super Alloy Power and hardened MOSFETs, features that we usually see on a top tier graphics card. This tells us that this card is a better overclocker than the Asus GTX 760 DirectCU II that I previously reviewed. 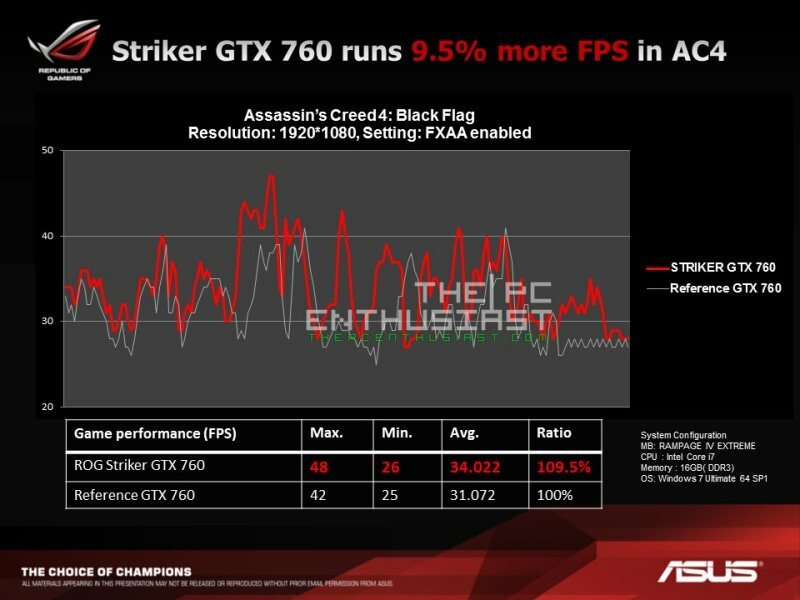 The Asus Striker GTX 760 Platinum offers up to 10% more frames per second in games like Battlefield 4 and Assassins Creed 4, or perhaps even more in some games, compared to a reference GTX 760. 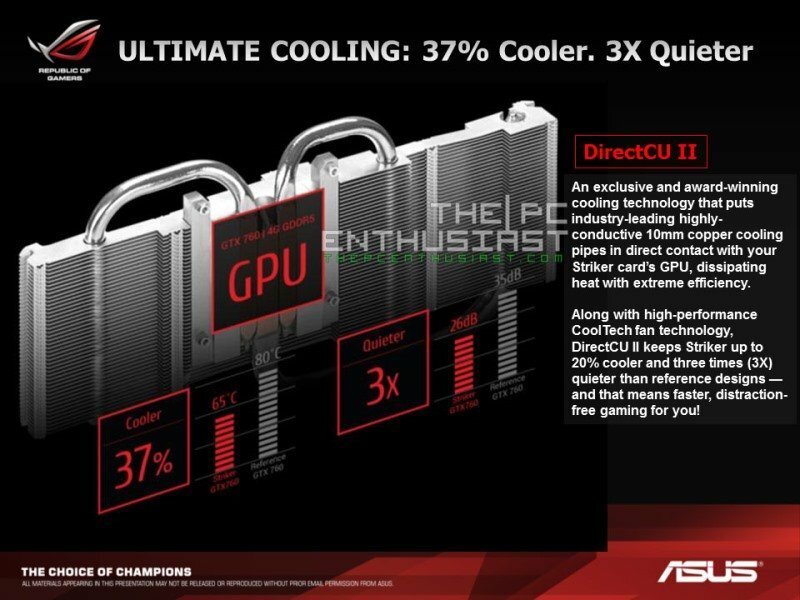 The huge heatsink beneath its shroud offers up to 37% cooling performance and 3x quieter compared to a reference card. Compared to the old Asus GTX760-DC2OC-2GD5, the cooling fan performs much better. This is necessary since it is expected that card would handle a much higher load and higher clock speeds compared to the reference. 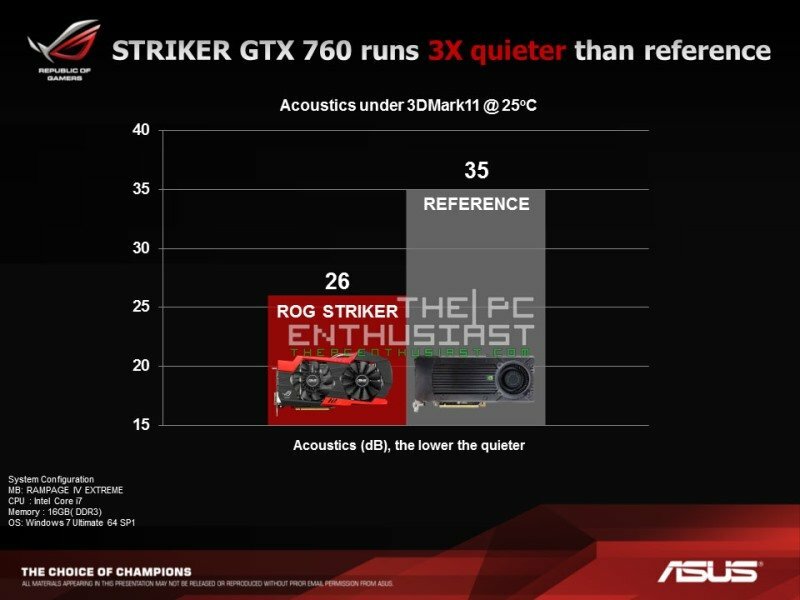 Here we see the performance difference, in terms of temperature and acoustics, of the ROG Striker GTX 760 from a reference one. Of course these may not reflect real world setup. In my case, the max temperature I got in full load under stock settings is 78 degrees Celsius. 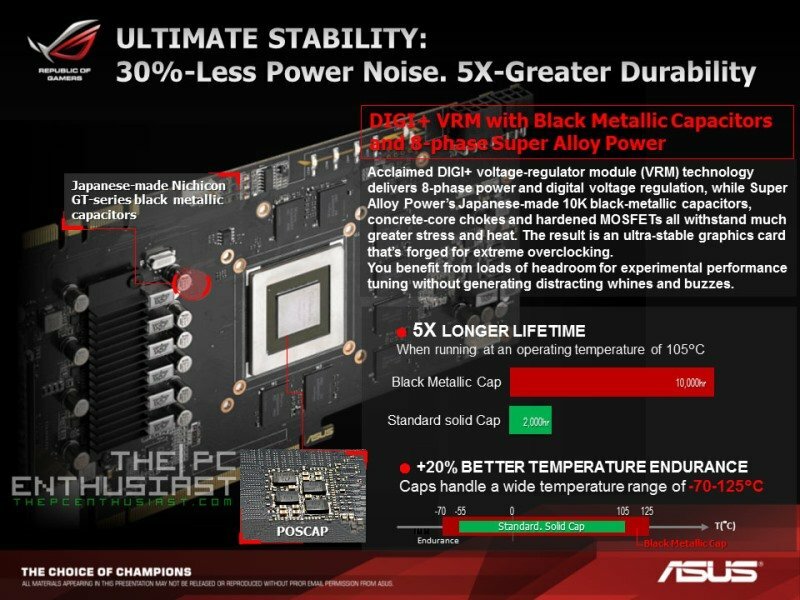 The Asus ROG Striker GTX 760 Platinum also features Japanese-made Nichicon GT-series black metallic capacitors, 8-phase Super Alloy Power and POSCAP that offers better temperature endurance, from negative 70 degrees to 125 degrees Celsius. 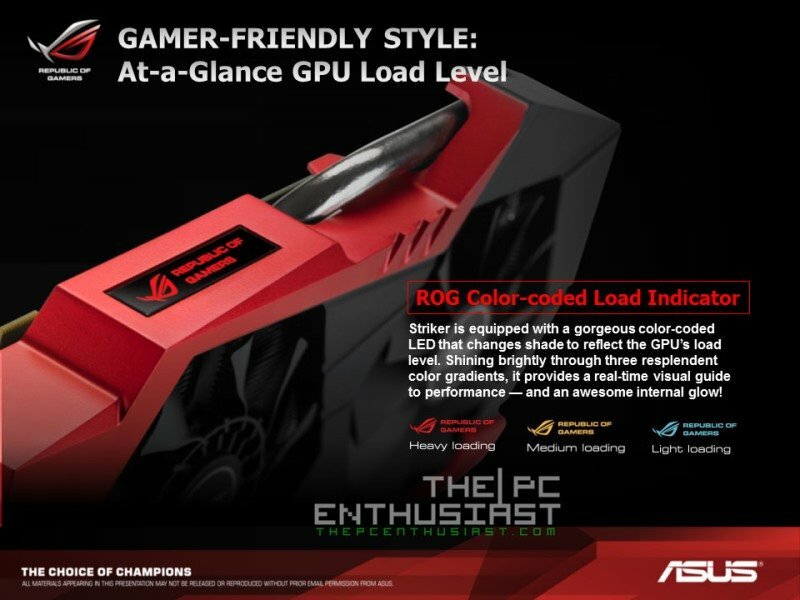 It also features an ROG color-coded Load Indicator, not to mention, there’s a cool red LED lining on its PCB near the power connector. During my initial test with the graphics card, I used the NVIDIA Driver 335.23. I tested the Asus Striker GTX 760 Platinum 4GB with 3DMark. Below are the initial results. I’ll post my full review very soon. Stay tuned! As of today, the Asus Striker GTX 760 Platinum 4GB manufacturer’s suggested retail price is not yet disclosed. Expect that this card will be more expensive than the Asus GTX 760 DirectCU II. 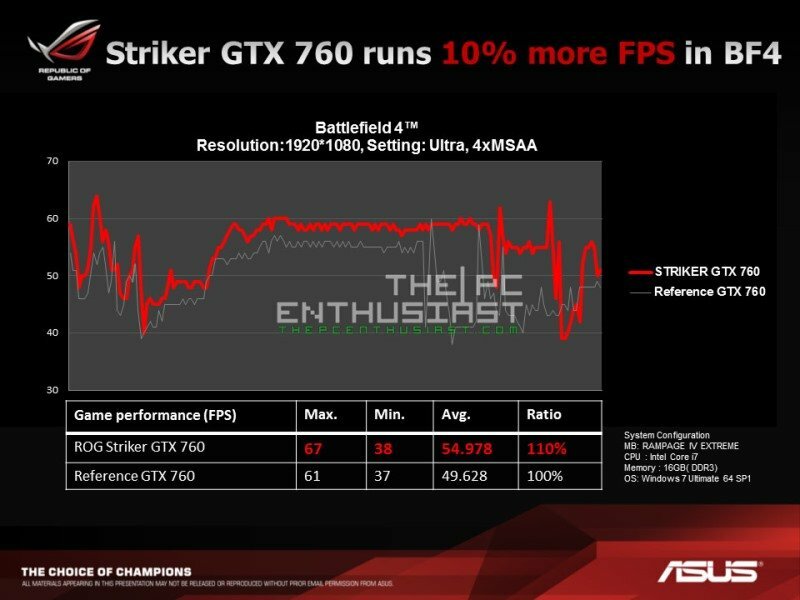 Hopefully it will not be priced higher than the Asus GTX 770, otherwise its price might be its major disadvantage. It is also expected that the card will become available starting towards the end of the month.